SOAPware DocumentationSOAPware FAQ'sFAQ's PrescriptionsQ: How do I change the prescription design printed or faxed from Rx Manager? A: Instruction on how to set your prescription document to use when printing or faxing prescriptions are below. Open Tools > Options > Structured Rx. In this dialog, the default design can be changed. This setting is user- specific, so it will need to be selected under each log in. Click on the Printing-Faxing tab. Click the drop down menu, to select the document design that will be used when printing prescriptions. 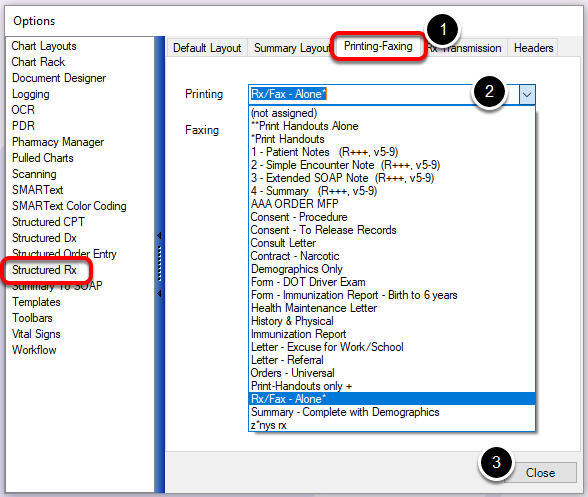 Use the drop down menu for Faxing to select the document design to be used when faxing prescriptions. Click Close and logout out of SOAPware to save changes. Previous Lesson: Q: How do I set up ePrescribing? Next Lesson: Q: How do I build a multi-page prescription?